Kemmangundi in the state of Karnataka, India, at a height of 1434m above sea level, ..
Discovering new ways of traveling has always been fun. A backpacking travel with constrained budget, moving around places halting at luxurious getaways, a motorbiking tour through the hills, casual traveling in trains has always been enjoyable but there is very limited content of exclusivity. For attempting something unique or for that matter something less often experimented, I contemplated a vacation in which the journey by itself is the main objective. The first thing that came to my mind was again motorbiking tour. But having done quite a few of them, I was still finding that it's too fast to enjoy the journey and sometimes monotonous in nature. I was looking for an alternative which is fast enough to cover a considerable distance over a period of days and slow enough to let you register the essence of the journey. It is when the idea of a cycling tour struck me. Being my first attempt I wanted to take it light and limited to a few days. I got in touch with a good friend of mine, Niraj, on this concept and he too being a travel freak was excited by this. Our physical fitness levels were not far different and we made up the perfect companions for such a ride. Our first choice was the dream of dream ride from Manali to Leh. But this time of the year isn't suitable for that and needs above ordinary fitness levels. So we chucked it out for now. Eventhough I am from Kerala, I have never got a chance to enjoy the state for the very reason it's been loved for. 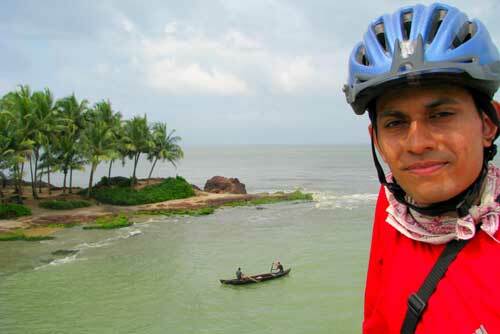 So I suggested him â€“ why don't we tour Kerala in our cycles. It was an idea which he couldn't resist and we decided to set out a plan lasting for 5-6 days. Since Kerala wasn't too big, in 5-6 days you can cover a considerable part of it. 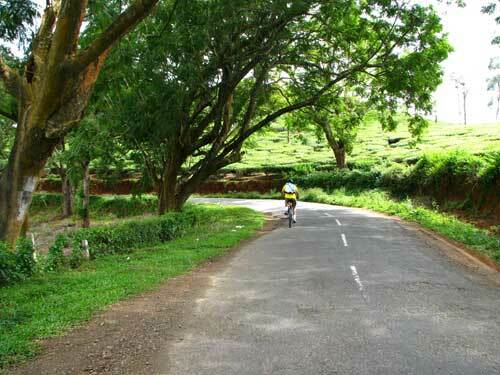 After some brain storming we put out a schedule that covers not only the excellent locales in Kerala but also touch upon riding through some of the most scenic roads running across Bandipur, Mudhumalai and Muthanga wildlife sanctuaries along the north eastern boundaries of Kerala. Speaking about our bikes, I was riding Hero Thunder MTB and Niraj had a Trek 4300D model. They were perhaps one of the best choices for the kind of mixed terrain that we would be riding. After convincing our bosses at work we set out the last week of September for this purpose. Safety concerns were pretty much high in priority and riding gloves and helmet were a must. Riding jerseys with padding were also taken for sake of comfort. We also stocked up on puncture kits and basic cycle maintenance tools. We were all set. Firstday evening, the penultimate day of our journey, we transported our cycles in a bus form Bangalore to Mysore. It was an experience by itself but we were relieved it went well. We comforted ourselves for the night in a homestay we had booked and were mentally getting ready for the next day. Our adrenaline was so pumped up that day that we wished we could have started right at midnight itself. Lying ahead of us were the best one could expect from a holiday - wild encounters in tiger reserves, immensely untapped country side locales in Kerala, ton loads of Kerala cuisine, pampering homestays, world renowned backwaters; in short 6 days of pure fun and lakhs of pedal rotations! We forced ourselves to sleep. 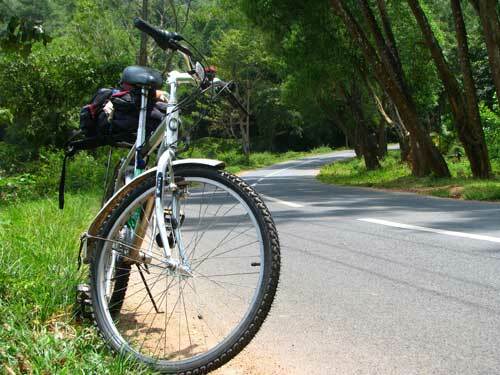 Day 1 ride from Mysore started calmly and by the time we reached the Bandipur forest roads we were in for a treat. Though I rode here last week in my motorbike, I didn't enjoy it as much as I did this time. We realized the advantage of a biking tour. The absolute forest silence broken only by the sound of crickets and frogs and your heavily pounding heart was incomparable. We got chance to see a herd of deer and elephant in the forest. The one thing that disturbed us quite a bit was the relentless travelers on the forest roads showing no concern for the delicate ecological balance in the forest. Some of them unnecessarily intimidate the wild animals for photographs. We just hoped things will improve with time. But on the whole, the ride set the tone of the tour very well. By around 4pm we were at the resort, Forest Hills, in Masinagudi where we would be resting for the day. There are many resorts around this area which happens to be one of the favorite weekend getaways for the Bangalore based vacation class people. An early dinner and we forced ourselves to the beds. 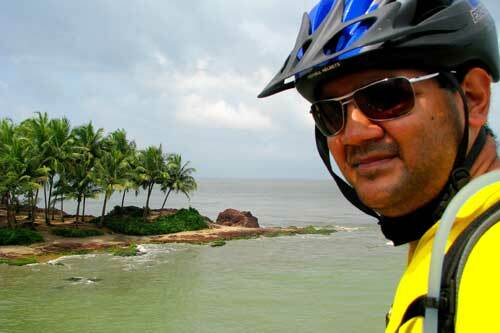 The second day's ride was till Sulthan Bathery. The route had lots of ups and downs. We wouldn't have noticed this if we were not on a bicycle. Seldom do people care about the terrain. But on a cycle, we count each of those climbs on the roads. The descends were like a well-earned gift for the hard pedaling done during the climbs. After sometime we forgot to count the climbs as we got used to it. From Masinagudi to Mudhumalai and beyond till Gudlur, the roads were excellent and the forests never looked more brilliant. 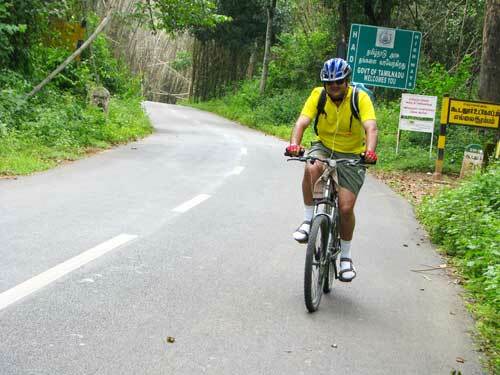 It took us a cool 2 Â½ hours of early morning cycling to cover the 40kms through forest. I had a wild encounter of a different sort which I never expected. I heard a roar from a big cat which could possibly be a tiger or a leopard which inhabited the forests and was like a trophy for enduring the terrain. From Gudlur to Sulthan Bathery was about 45kms. 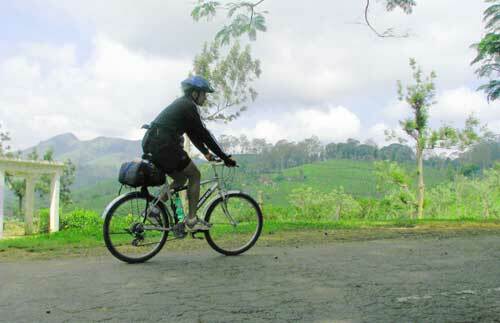 The roads were again excellent which criss-crossed through coffee and tea plantations. Very long stretches of climbs sapped our energy but the descends that followed gave us enough respite to catch hold of our breath. We reached our homestay for the day's break at around 2pm and let us be pampered by the comforts and cuisine at the homestay. The third day was probably the most looked forward day because we would be encountering the killer of all descends. From Sulthan Bathery to a place called Vythiri in Wayanad district, the roads were excellent for an early morning warmup but nothing could get us distracted from the excitement that lay ahead. From Vythiri to Adivaram (Downhill) we will be losing 700m altitude covering just about 12km. The views from the topmost point called Lakkidi viewpoint were spectacular even at 11am. The downstretch tested our brakes a little bit because of occasional bad roads but we were the kings of the roads by the time we reached down leaving all other modes of transport behind to navigate the tricky hairpins and the truck traffic. Our happiness showed no bounds but as a dark lining in the silver clouds we won't have any altitude advantage now. Its all plains from here! Our destination for the day was a beachside homestay facing the Kappad beach (Calicut). We made our way till there comfortably, tasting the brilliant Kerala meals on the way. A dip in the beach was sufficient to re-energize us for the rest of the ride. Our plan for the 4th day was to avoid the National highways as much as possible. We took the coastal route primarily covering Beypore, Kadalundi wildlife sanctuary, Ponnani and finally ending the day in Thrissur. We had two ferry crossing today â€“ one at Beypore and the other at Ponnani. As expected both of them were an experience of a different kind. The junkar used to transport people as well as light motor vehicles were a treat to travel. The coastal route which we took was by itself refreshing and scenic. The view from Kadalundi Bridge overlooking the Bird sanctuary and a newly constructed railway line was an icing in the cake. One thing we started noticing after leaving behind the more sophisticated Bangalore crowd behind was that people were increasingly mistaking us for foreigners after seeing us in all the possible cycling gears. It gave us some celebrity status but was short-lived when I explained to them that we are very much Indians. After Ponnani we joined back the National Highway and reached Thrissur going via Guruvayoor. A slight deviation from the NH to reach Guruvayoor was worthwhile as it took us through paddy cultivations and some wetlands surrounding them. We opted for a budget accommodation in Thrissur as we reached ther pretty late and our day begins much earlier the next day. The fifth day's plan was to go via Ernakulam to Vaikkom. Niraj will be joined by his wife, Hema, at a homestay there and they would be testing out Kerala cuisine and backwaters for 2 days and then flying back to Bangalore from there. Vaikkom has a famous Shiva temple where thousands of devotees come visiting every year. Further it was at the east coast of the world-renowned Vembanad lake. I didn't have a definite plan for the day but eventual goal was to reach Alleppy by the end of the day to spend the night in my Aunt's place. Our ride till Vaikkom was eventless and had a huge bulk of it was though highways. After reaching Vaikkom by noon time I bid adieu to my partner after sharing some of the most cherished moments of our life. Having no certain plan for the rest of the day, I took a ferry from Vaikkom to the other side of the Vembanad lake. The lake which adorns the south central part of Kerala surrounded by Alleppy district on the west coast and the famed Kumarakom on the east coast is the mainstay if livelihood and means of transport for people around there. And of course it has been a paradise for tourists both domestic and foreign. The view of the backwaters as one navigates the coastal route is perhaps the best one could ask for a peaceful getaway. After crossing over to the west coast by ferry I realized I had pretty much time at my disposal and after asking around a little bit, I crossed over to the east coast again through a newly constructed bridge. It gave me amazing views of the lake and some good sightings of houseboats. My visit to Kumarakom was short and I spend some time inside a bird sanctuary there and headed back as it was getting dark. The ride back uneventful and reached Alleppy right in time for dinner. After being pampered by my aunt with an excellent dinner and broke the day. The last day's ride was through National Highway and didn't offer too many photo opportunities. But my cycle got me engaged with it after it had a recurring pedal related issue. But 'back to home' feeling kept me going and by 4pm I was at my home. I would have expected a reception given to the likes of Lance Armstrong after his Tour de France completion, but being no celebrity I was on my own. My imagination gave me my 2 seconds of fame when it related a beautiful stretch of human high lush green bushes to people cheering me to a well-deserved end of tour. After the tour, one thing that reverberates in our thoughts was whether we toured the country-side locales in Kerala or was it the actual 'country' itself. The sophistication of city crowd is indeed nice, but what pleases you is the simplicity of the people in smaller towns and their warm-hearted nature. Being on a cycle, it gave us an opportunity to interact with them more freely and they too was outrageously happy to see desi guys cycling through their backyard, one of them even speaking their mother-tongue. The impressions that this tour left in us was awesome and is an inspiration to keep us trying more challenging tours like this. As far as our physical state of affairs s concerned we realized that we wouldn't have pushed ourselves so much if the desire to be a part of such exclusivity was not there. We could still not believe that an untrained body can take an abuse of 770kms of pedaling in just six days. I framed up a two-liner to put the whole ride in perspective - 'Possibility is limited only by the extent of imagination. Feasibility is limited only by the intent of implementation.' Hope this inspires us and everyone else to try out more adventures like this.